The Compunetix Video Systems Division will have a presence at two booths in conjunction with four newly announced partners at this year’s Enterprise Connect! On March 18 – 21 in Orlando, FL, VSD will be exhibiting at booth 530 with Sonexis to demo the new integration of the EVERGREEN video MCU and ConferenceManager, the scalable audio platform for the enterprise. Booth 1337 will highlight the Total Solution Initiative with cornerstone companies AVer, BurstPoint, Vidtel, Chorus Call, and Compunetix. Stop by to see how this group is reshaping the way everyone from small businesses to the largest telcos can choose full-featured collaboration as a service, build it on-premise, or create it in the cloud. For more detailed information on each of these new Compunetix partnerships, check out our press page. 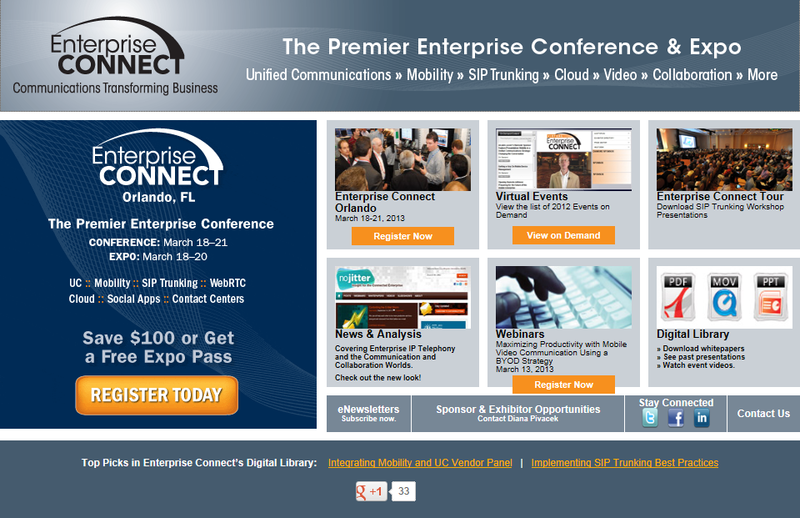 Haven’t signed up for Enterprise Connect yet? There’s still time; click here!